Though nominations haven’t even been announced, I think the following actors are going to win Oscars come February 22, 2009. This is not based on counting how many nominations/wins they’ve racked up from other organizations; I’m going strictly by my opinions of their performances and feel confident about my choices. If you’re participating in an Oscar pool, feel free to steal my predictions. When you win, just send me 10% of your winnings! Best Actor: Sean Penn for Milk. This is Penn as we’ve rarely seen him—smiling, vulnerable, in love, inspiring—instead of angry, grim or high. He brings Harvey Milk vividly to life and makes us feel the loss of the real man all over again. 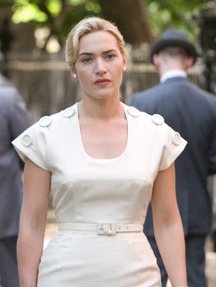 Best Actress: Kate Winslet for Revolutionary Road. I’ve liked some of her other performances better—Clementine in Eternal Sunshine of a Spotless Mind, Sarah in Little Children—but this year has been light on female contenders so I think Winslet will finally get her little golden man for this harrowing performance. Best Supporting Actor: Josh Brolin for Milk. The film’s cast is very, very strong but, besides Penn’s, Brolin’s performance as Dan White is the one that stayed with me long after I saw the movie. It’s a beautifully nuanced portrayal of a man in conflict with himself and the changing world around him. Best Supporting Actress – Penelope Cruz for Vicky Christina Barcelona. She is on fire in this film. She’s passionate, electric, crazy, and just uninhibited. When she’s on screen, you can’t watch anyone else. Considering the other actors include Javier Bardem and Scarlett Johansson, that’s saying a lot. I’m not going to pick Best Picture because I’m not passionate about any of the contenders. There are some good films but none made me say, “Wow, I LOVE that movie!” I remember back in 1981, my favorite movie was Raiders of the Lost Ark but Chariots of Fire won. Chariots was respectable, but it didn’t blow my mind like Raiders did. In 1995, I admired the production values and talent involved with Braveheart, but I was rooting for Babe on Oscar night. At least Raiders and Babe were nominated for Best Picture. My favorite film this year, with probably no chances for any Oscar nominations (though I was thrilled it received 3 major Golden Globes noms), is In Bruges, a film starring Colin Farrell, Brendan Gleeson and Ralph Fiennes that I saw back in January and has long been out on DVD. This movie is well-acted, brilliantly written, suspenseful, hilarious, twisted and most important (to me), it was damn entertaining. What are your favorite films this year that you think have about as much chance of being nominated as Oprah has of being poor? Leave me a comment below. Here’s hoping you’ve enjoyed yourselves at the movies this year and will have many good reasons to go to the theater next year. COMING SOON: An evening with the director (Edward Zwick) and cast of Defiance (Daniel Craig, Liev Schreiber, Jamie Bell, Alexa Davalos), and the stars of Revolutionary Road (oh, you know who they are). Last week, on the day it was chosen Best Picture by the National Board of Review, I went to a screening of Slumdog Millionaire (about a slum kid who goes on the Indian version of Who Wants to be a Millionaire?) 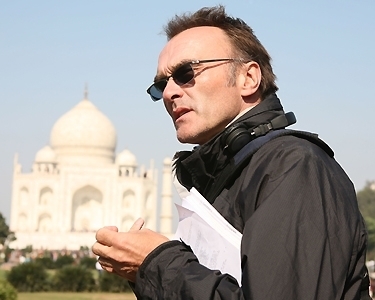 and Q & A afterwards with director Danny Boyle, cinematographer Anthony Dod Mantle, editor Chris Dickens, and composer A.R. Rahman. The movie has been in theaters for a few weeks (I held out for the free screening ’cause I’m cheap) so I won’t review it but will say you should see it if you haven’t already. Considering the recent terrorist attacks there, the movie is a life-affirming tribute to the hope and resilience pulsing through Mumbai. 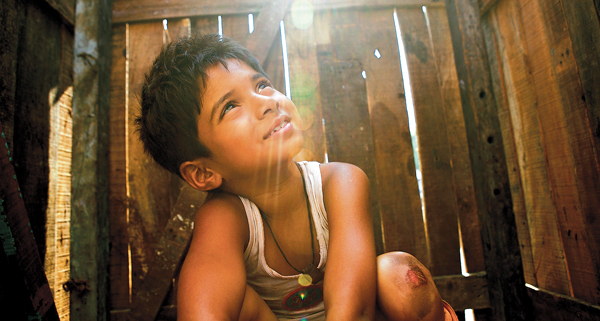 Some of the other Golden Globes Best Picture contenders can be more cerebral than warm but Slumdog is all heart. The Q & A, moderated by director Taylor Hackford, offered interesting insight about the process of making this film. The following is not verbatim but I took notes like mad and here are the highlights. Hackford (Ray, An Officer and a Gentleman) introduced Boyle, Mantle, Dickens and Rahman to a standing ovation. I’ve been to a lot of screenings and this kind of reaction is rare, especially when there’s no big star on stage. It’s a testament to these men’s achievements in the movie. “I hate in American television when a 29-year-old is cast to play a 17-year-old and then grows older to be 29. [In the script], the first stage was 10, then 16 then 25. When we got there, we felt they should be younger. [But] the 7-year-olds didn’t speak English. Our casting director suggested we change it to Hindi because it’s more authentic. Then we told Warner Bros. a third of the movie would be in Hindi and they were absolutely thrilled!” Boyle said jokingly. He said in fact there was a long moment of dead silence on the other end of the call. “Each actor is so distinct, it’s extraordinary. They all had big ears; it’s fantastic casting. 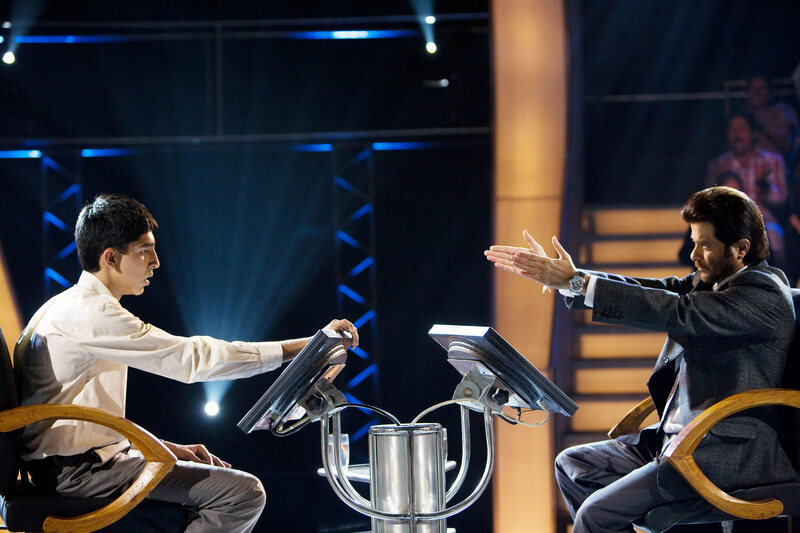 The game show host is oily, just perfect…It’s a very Dickensian story,” Hackford said. “We took one question out because it wasn’t right. There are only twelve questions or something [on the show],” Dickens said. “The question will be on the DVD,” Boyle said. “Two of them, the youngest ones. We put them in school,” Boyle said, to audience applause. “The girl is very bright, the boy is not quite as academic but he’s very good with crayons and coloring in.” Boyle went on to explain that money was put in a trust fund for them until they’re sixteen. “The children didn’t know how old they were because they didn’t know their own birth dates.” They were given dates and introduced to the tradition of celebrating birthdays and receiving gifts.”Now they love birthdays,” Boyle said. Hackford asked how long the shoot was. “We were there November, December, part of January,” Boyle answered. Hackford asked Boyle if, once he got to Mumbai, he ever thought he was crazy to try and make this movie there. “A.R. Rahman has sold two hundred million cassettes [of music]. How did you end up working with him?” Hackford asked. “I lost eleven kilos [about 24 lbs.] but from running. I was never sick,” Boyle said. Someone asked what the film’s budget was. Another audience member asked Boyle to talk about how he’s always pushing the envelope in his filmmaking. “The kids running through the slums in the beginning, that track of the movie,” Boyle interjected. Rahman then said the collaboration involved him sending the temp to M.I.A. in New York and her sending it back to him via the Internet. If you’re on my subscribers list and are among the first 5 people to answer the following correctly, I’ll email you a copy of the Frost/Nixon script, written by Peter Morgan and adapted from his same-titled play. The movie opens in limited release this Friday, December 5. Richard Nixon’s first scandal happened in the 1950s when he was the V.P. candidate on Ike’s ticket. He was accused of being secretly funded by a group of California businessmen. To address these charges, Nixon went on live TV to make his famous “Checkers” speech, which was scheduled after what popular show? I’m happy to say it isn’t dull as dirt. Frank Langella, Michael Sheen and director Ron Howard make the film crackle with tension. Richard Nixon and David Frost’s duel is just a more verbal version of Jim Braddock and Max Baer’s fight from Howard’s Cinderella Man. Like that boxing match, you have a heavyweight sparring with an underdog who proves to be much more pit bull than anyone expected. A quick montage at the start of the movie fills in anyone who’s been living on Mars on the Watergate scandal and fallout, including Nixon’s resignation and Ford’s pardon. We see Frost watching the televised resignation speech, practically drooling over the audience it garnered. He decides to woo Nixon for an interview strictly for ratings at first. Soon, pressure mounts from his peers for him to elicit an apology from the former president. But Nixon is a formidable opponent, trained in public speaking and how to be “presidential” while Frost is disdainfully referred to by some as “just a talk-show host.” We see Frost training for his big fight by immersing himself in the minutiae of Nixon’s life while struggling to land financial backers for his show (Nixon’s fee alone was $600,000). This all leads up to the movie’s main event on April 22, 1977—the final day of interviews during which Frost would pin Nixon into a corner about his shady Watergate dealings. 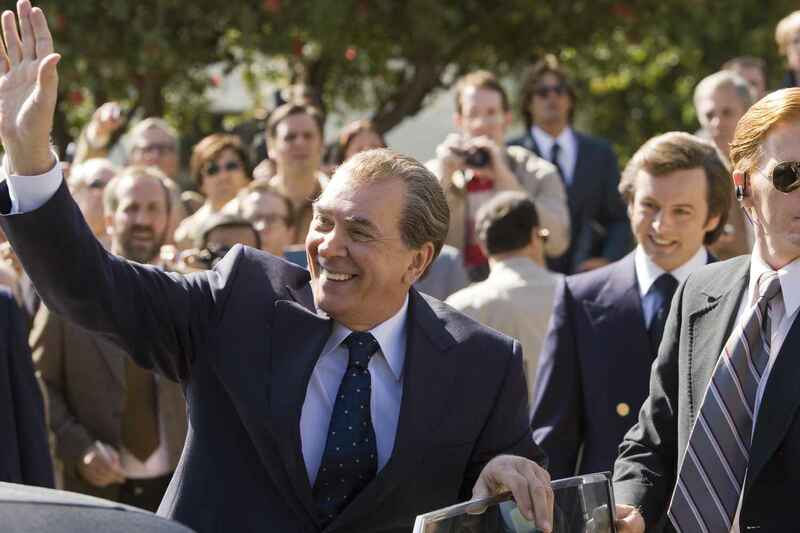 Langella brings Nixon roaring back to life and thankfully does so without prosthetics. He relies on his talent to portray a man too proud to say sorry but too burdened if he didn’t. The actor does use that familiar guttural voice which calls to mind all the Nixon (and Jimmy Stewart) impressions I’ve ever heard. But it’s not Langella’s fault Nixon sounded like that and after a while I got used to it. Sheen’s performance, though, is my favorite in the film. As he readies his slingshot for his Goliathan opponent, we can see the insecurity and vulnerability beneath the perennial grin and slick TV-host veneer. Sheen actually made me wonder at times if Frost would be up to the task though I already knew the outcome. Universal Pictures has decided to submit both actors for Best Actor Academy-Award consideration and I hope Langella doesn’t overpower Sheen, who has the less showy but more difficult role. Among the solid supporting cast, Kevin Bacon, as Nixon’s steely Chief of Staff Jack Brennan, was a head above the rest for me. You might be quick to label him a jerk until you glimpse the heart beating beneath the surface. Bacon made me feel that of the millions who were disappointed and hurt by Nixon’s Watergate involvement, Brennan was the one who took it hardest. In bringing Frost/Nixon to the screen, writer Peter Morgan (who also wrote the play) and Howard were successful where John Patrick Shanley was less so with Doubt—opening up a play to make it more cinematic. Doubt the movie comes across like a filmed play (see my review here), but Howard said in the Q & A I attended that he was determined to have Sheen and Langella break the rhythm of the stage dialogue they’d already performed many times in London and on Broadway. He also employs a faux documentary style with lots of cross-cutting between scenes and interviews and archival news footage. Howard can sometimes be too safe for me but he does really sharp work here, taking a story whose ending is already familiar to a whole generation and making it compelling and fresh again. 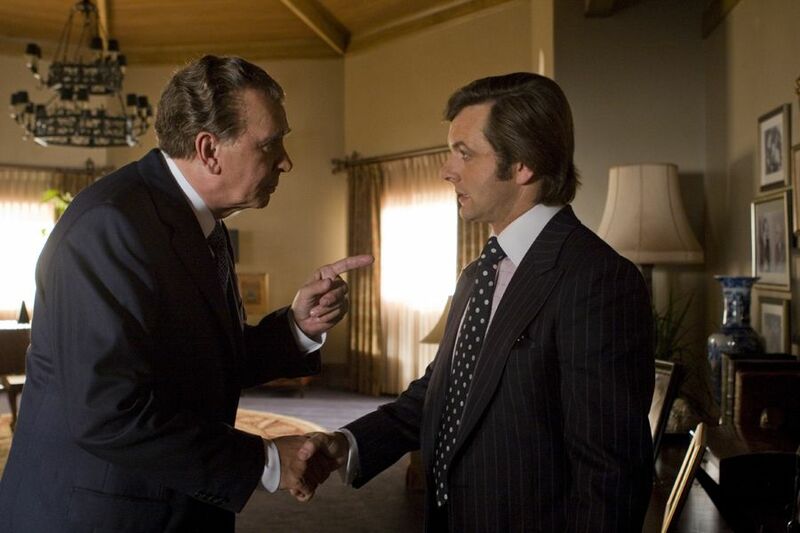 SCRIPT GIVEAWAY: On Wednesday, December 3, at noon PT, I’ll be giving away Frost/Nixon scripts. At that time, I’ll post a trivia question about Nixon and the first 5 subscribers who leave the correct answer in the comments section will be emailed a PDF version of the script. You have to be a subscriber to be eligible so even if you’re the first person to leave the correct answer but you’re not on the list, you will not get a script. I never spam so if you haven’t subscribed but want to participate in future giveaways, do it now!